In this series, NerdWallet interviews homeowners across the country about their unique homebuying journeys and the financial decisions that helped them get there. Madison, Wisconsin, is known for a strong arts and food scene, a college-town vibe — and an increasingly competitive housing market. In fact, the median home value in Madison is currently $252,000 and is predicted to rise by 7.3% within the next year, according to Zillow. What brought you to Madison? About six months ago, we moved to Madison from the Twin Cities region to be closer to my friends and family. I’m originally from Wisconsin. Why did you decide to buy a home there? We had a beautiful house [for four years] in Red Wing, Minnesota, where we moved from. When we decided to relocate, I knew I wasn’t going to rent again. We sold the other house for around $270,000. In a dream world, we wanted something super sleek and modern with big, open spaces, since we like to entertain. But to get those expansive open spaces in Madison, you need to buy a mansion with six or seven bedrooms — so we kept looking. We wanted to be in the heart of the action because we had always lived 15 to 30 minutes outside of a major city. We needed space for Rome’s art studio, a home office so I could work from home sometimes, a yard for our dogs, and a two-car garage. We didn’t want to go over $250,000. 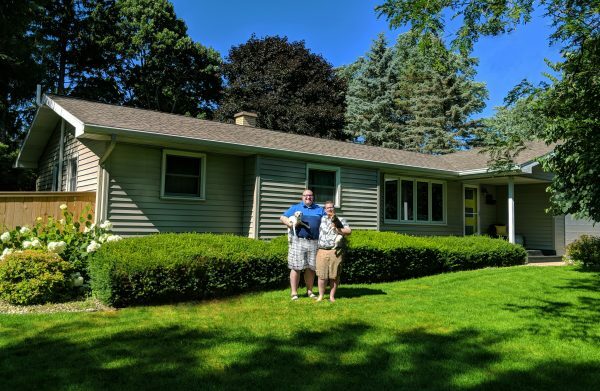 We sold our Minnesota house in just four days and started house hunting in Madison immediately. We came down every weekend to look at places. We were out of our house and living in a hotel for three weeks until we finally closed in December 2017. It wasn’t fun to move in the winter. It was really important for us to work with a real estate agent from the LGBTQ community because we’re part of that community as well. Our good friend told us about Vivienne, who was great and down-to-earth. We made offers on nine different houses. The market was incredibly hard. One time we offered $15,000 over asking and still lost out. Things weren’t going well until we found our current home, which had been on the market for over six months because it wasn’t showing well. We landed at $246,000. It’s not the house we envisioned, but it’s becoming home. It was built in 1961 and had been occupied by the same couple for the past 30 years. It’s a traditional three-bedroom, two-bathroom ranch-style house with a big living room, a fireplace, a decent-sized kitchen, a recreation room, a screened porch and a two-car garage. We’ve done a lot in the past six months to put our personal stamp on it and have plans to add a master suite and remodel the downstairs. We’re not sure if this will be our forever home or just for the next five to 10 years. What’s your approach to finance, and how did you save for the home and move? I tend to do all of our finances. We used about $10,000 from the sale of our last home toward this one, but we also had some money saved up. The moving truck, movers and storage all added up. We had to live in a hotel for a while, so we searched for deals and explained our situation to hotel management. A few gave us free parking, free Wi-Fi and meal passes, and didn’t charge for the dogs. My employer didn’t offer a relocation package, but I asked for help with some of the hotel costs, which saved me about $1,500. Vivienne negotiated the use of the garage in the new house during escrow so we could store our belongings while we were staying at the hotel. Starting a new job while living in a hotel — and while Rome was still student-teaching — was a challenge. We might have been a bit more aggressive and bid higher with the first few homes. What advice would you give to someone considering moving to Madison? Buy your next house before selling the one you’re in. Had we sold our house later, we wouldn’t have had to live in a hotel. Always have two preapproval letters. You never know when one might fall through, and it’s nice to have a backup plan. Go north. Andersen says that many first-time home buyers are flocking to the more affordable northern side of the city, a revitalizing cluster of neighborhoods that includes Cherokee Park, Sherman Village and Whitetail Ridge. $200,000 is the starting point. “The price range for first-time buyers in Madison is neighborhood dependent, but realistically, $200,000 is the minimum for a move-in-ready place,” says Andersen, adding that $250,000 is a “typical budget” for her younger clients.